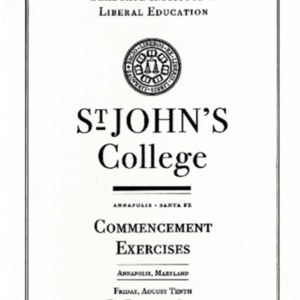 Addresses given at commencement and programs of events related to, and including, the commencement ceremonies held every year at St. John's College. Includes both the undergraduate and Graduate Institute commencements. 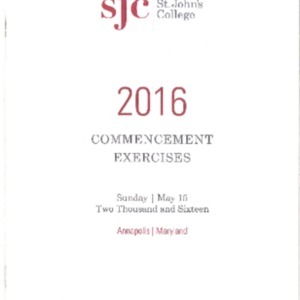 Click on Items in the Commencement Programs and Addresses Collection to view and sort all items in the collection. Program for the two hundred twenty-fifth commencement in the three hundred twenty-first year of the college. 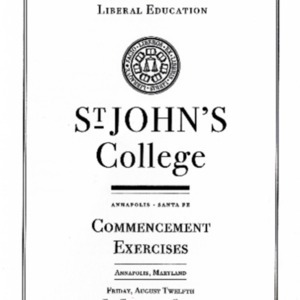 Program for the two hundred twenty-fourth commencement in the three hundred twentieth year of the college. 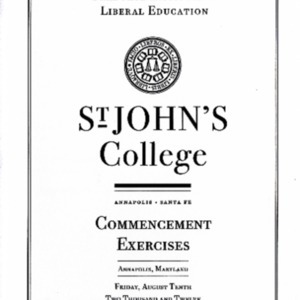 Program for the two hundred twenty-third commencement in the three hundred nineteenth year of the college. 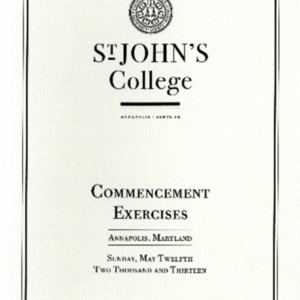 Program for the thirty-sixth summer commencement on the Annapolis campus of the Graduate Institute in liberal education. Program for the two hundred twenty-second commencement in the three hundred eighteenth year of the college. 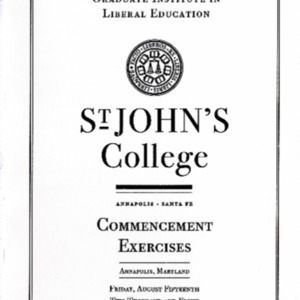 Program for the thirty-fifth summer commencement on the Annapolis campus of the Graduate Institute in liberal education. 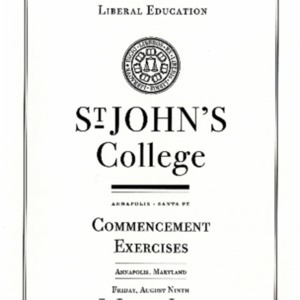 Program for the two hundred twenty-first commencement in the three hundred seventeenth year of the college. 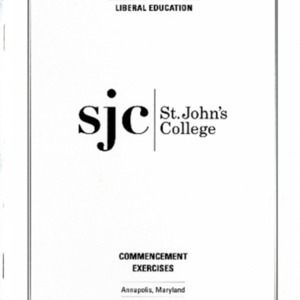 Program for the thirty-fourth summer commencement on the Annapolis campus of the Graduate Institute in liberal education. 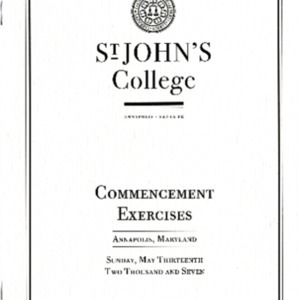 Program for the two hundred twentieth commencement in the three hundred sixteenth year of the college. 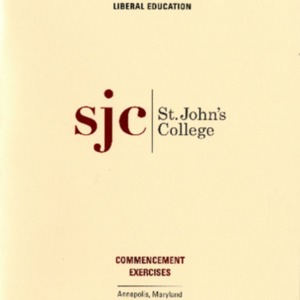 Program for the thirty-third summer commencement on the Annapolis campus of the Graduate Institute in liberal education. 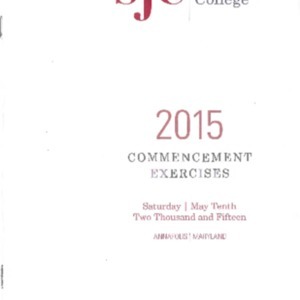 Program for the two hundred nineteenth commencement in the three hundred fifteenth year of the college. 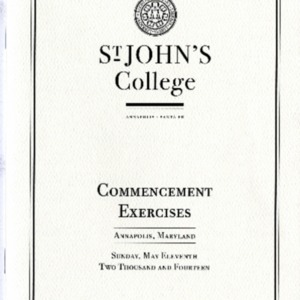 Program for the thirty-second summer commencement on the Annapolis campus of the Graduate Institute in liberal education. 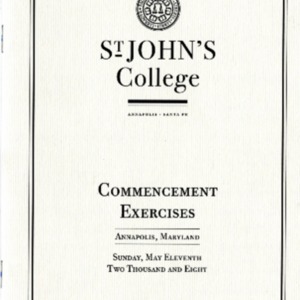 Program for the two hundred eighteenth commencement in the three hundred fourteenth year of the college. 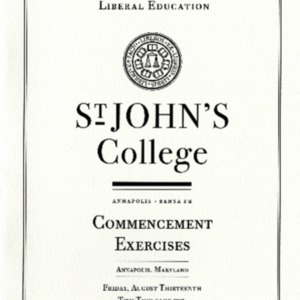 Program for the thirty-first summer commencement on the Annapolis campus of the Graduate Institute in liberal education. 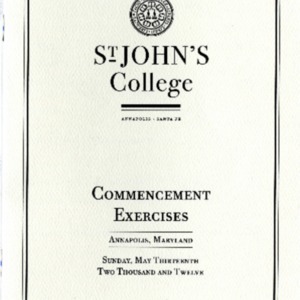 Program for the two hundred seventeenth commencement in the three hundred thirteenth year of the college. 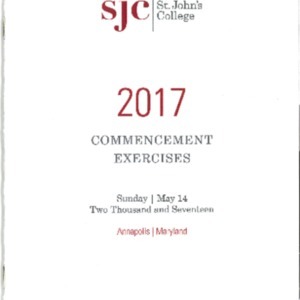 Program for the thirtieth summer commencement on the Annapolis campus of the Graduate Institute in liberal education. 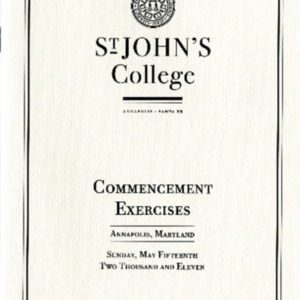 Program for the two hundred sixteenth commencement in the three hundred twelfth year of the college. 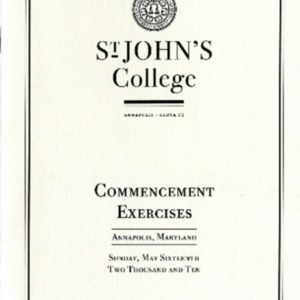 Program for the twenty-ninth summer commencement on the Annapolis campus of the Graduate Institute in liberal education. Program for the two hundred fifteenth commencement in the three hundred eleventh year of the college. 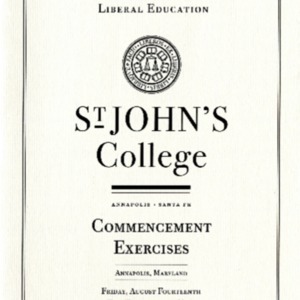 Program for the twenty-eigth summer commencement on the Annapolis campus of the Graduate Institute in liberal education.